The 1st house rules who you come across as. Compare this to the Sun, which shows who you are with those who know you best; the Sun is the inner you while the 1st house is the outer you. The sign on the cusp and any planets in this house will have major influence in your outer personality, looks, and presentation, and the general energy you exert. 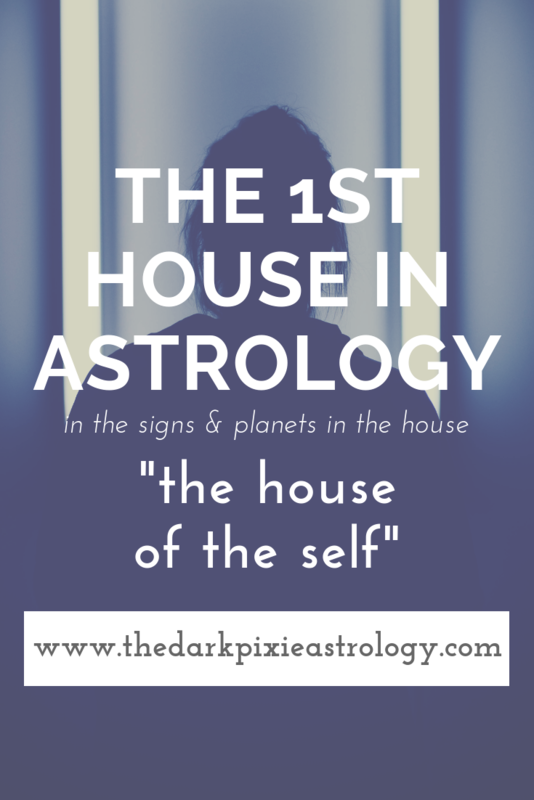 One interesting note about the 1st house is that we all tend to want to put our best foot forward, so we tend to play up mostly the positive aspects of the sign on the cusp and planets within the house. The 1st house is on an axis with the 7th house (the exact opposite house), and is also called the Ascendant or AC for short (because it's derived by finding the sign ascending on the horizon at the exact moment of birth). The sign on the cusp is called the rising sign. This house is the house of the self, whereas the 7th house is the house of others. The 1st house is ruled by Aries, Mars, and is an angular house, all action, so a load-up of planets here could show you're someone who likes to DO. You come across as someone who is independent, assertive, and has a positive attitude. At times, you may be overly aggressive or competitive, but you usually don’t mean any harm. You like to throw yourself into projects and plans, enthusiastic about trying anything new. You have plenty of energy that needs to be used up or you get grumpy. Be as physically active as you can. You can be a great leader as long as you keep your anger in check. People look to you almost instinctually to lead them, and it feels natural for you to pave the way and be a trailblazer. You come across as someone who is stable, reliable, and takes their time. You don’t want to be rushed, at least when you’re around others or in public. You need to indulge in your senses, and can seem like a sensual person. You can stick to what you believe in, your decisions, and your ideas, no matter how much other people try to push you. You don’t seem like the kind of person that can be pushed into anything you don’t want. You try to be practical, and people look to you to be the grounding influence when everything seems to be unstable. You come across as someone who is intellectual, adaptable, and always up for some good conversation. You strike up conversations with anyone and everyone no matter where you are, and have knowledge that’s wide-ranging, but perhaps not too deep. You need mental stimulation, and like to be around other people as a result. You’re likely always smiling, even when you don’t feel happy. You can adapt more easily than others to different situations and people, but it can make you wishy-washy in public or with new people. People look to you to start the intellectual debate. You come across as someone who is nurturing, sensitive, and shy. You can seem quite emotional publicly, but you try to keep your feelings to yourself. You interpret situations and get a sense of new people through your emotions. You can pick up the emotions coursing through any situation, and can understand what people are feeling. This makes you seem like you’re psychic, and you should listen to your instincts because they process what you may not see with your eyes. People look to you to be the comforter, the nurturer, the protective one, the mother. You take care of those around you, and are seen as the mother hen. You come across as someone who is friendly, positive, and strong. You love to be around people, and can be the life of the party. You need attention, affection, and praise, so you need people around you. You have a strong personality, so people may be drawn to you without you trying. You seem like a fun person, full of jokes and laughs, and you have a kind heart, or are at least generous in public. Leo rules royalty, and you can seem like you’re someone who should be at the helm and treated with dignity. People look to you to bring in the drama and make everything more fun. You come across as someone who is practical, logical, and analytical. You have a keen eye for the details, and none will escape you. You can see the details in every situation, though the big picture can be hard for you to grasp. You’re the one who takes detailed notes and lists and tries to stay organized. People look to you to keep everything in order and bring some structure and routine. You may seem a little nervous publicly, unsure of yourself, and need to stay busy. You can work yourself ragged, and will do the work that no one else wants to do, though you may prefer working on your own. You come across as someone who is graceful, mediating, and sociable. You may get along with everyone that you meet because you know how to carry yourself well in public, and know what to say and do to not offend anyone. You have an easy time compromising with others, getting people to find middle ground, and people look to you to bring everyone to the table and find a solution that works for all. You try to be balanced, at least publicly, and might feel out of control when you’re in an environment that lacks harmony or order. You come across as someone who is powerful, magnetic, and a mystery. You can keep a lot to yourself, not wanting to reveal all in public, and this draws people to you. You tend to have an intense stare or a brooding expression on your face all of the time, and people wonder what’s going on behind those deep eyes. Some may find your intensity to be overwhelming, and you can be somewhat intimidating at times. In most situations, you won’t back down no matter what, and people look to you to be the rock, to take control, and to get through anything. While you are emotional, you know how to control yourself. You come across as someone who is fun-loving, optimistic, and always on the go. You want to have a good time, are a great conversationalist, and are full of stories that you tell in a grand, entertaining way, making you an excellent storyteller. You want to experience the world and everything in it, and it can be hard for you to stay still. This can make you try a lot of things that might not be wise, but you can be so lucky that everything works out in the end anyway. People look to you to show them the bright side of the situation, and to be honest with them. You come across as someone who is responsible, ambitious, and disciplined. You seem serious and mature, and you can take your time when you’re working hard at achieving something. You have goals, but you don’t rush them. You have enormous self-discipline, especially in public. People look to you to point out the big picture, the long view, because you understand how one thing leads to another more easily than others. You may be emotionally distant in public, but you can also seem a bit shy or insecure. You carry yourself well in public, and seem more traditional. You come across as someone who is innovative, original, and unconventional. You can think of things that no one else can, and seem like such an inventive person. You’re an excellent problem solver as a result, coming up with solutions that seem so strange but work well. You drag people into the future, always looking toward the future, and make people think about how things need to be changed. People look to you to show them what the future holds. You may seem like a rebel, and you want to be able to be yourself, no matter how different that may be from everyone else. You come across as someone who is compassionate, shy, and a dreamer. You can get lost in daydreams and fantasy easily, and you seem like your head is always in the clouds. At times, it may be difficult for you to understand people clearly, or to be understood clearly, and you can follow what other people say too easily. You need to become more sure of yourself, and know yourself better so you’re not following anyone else. You can be extremely creative and artistic, a visionary to some, and can express yourself emotionally through art. People look to you to be empathic and sensitive. With your natal Sun in the 1st house, you’re someone who always makes a lasting impression on people, and this can make you feel self-conscious at times. You try to come across as someone who is strong and secure, but you secretly care about what other people think about you far too much. You need to learn that what other people think about you doesn’t matter, and accept the impact that you make. If you really want to be strong, you need to develop your own identity and really know who you truly are. You can be a fantastic leader of people if you don’t become too tyrannical or proud. You’re enthusiastic and can do things on your own without anyone holding your hand along the way. You’re very sensitive and can fluctuate like water, changing to fit the situation or people around you. Change comes easily, so you’re not one to get left behind, but you may have trouble differentiating between what you feel/think and what everyone else does. Sometimes you may change too much, unable to let things stay as they are long enough for real progress or success to be had, and you may seem moody. You can emotionally react to situations instantly, without a single thought at all, which is good in that you’re close to your feelings and have better intuition, but not-so-good when you stick your foot in your mouth of go overboard about a situation. You need to learn how to blend your mind and emotions together to make better decisions. You don’t hide your feelings, so everyone knows what’s going on with you, but sometimes discretion is necessary. Sometimes you may wish you had a mute button. How people see you affects your self-esteem, and you value other people’s opinions, sometimes more than your own. Figuring out who you are, especially in regards to your emotional nature, may be something you have to work on for a large chunk of your life. With your natal Mercury in the 1st house, you take an intellectual approach to situations, and come across as someone who thinks a lot, even too much. You love conversation but may be a talker rather than a listener. You have a childlike curiosity, especially with new projects or ideas, and you tend to react in a more analytical manner instead of an emotional one (unless your Moon is also in the 1st house). You may need to get out of your own head. You need some variety in your life or you get bored easily. You can become scattered and have a hard time focusing on one thing for very long. You’re an adaptable person, which can make you a good problem-solver. With your natal Venus in your 1st house, you tend to be someone that people are attracted to, and you can be charming and fair. You present yourself well in public, and try to negotiate compromises and make sure everyone is getting along. You can be superficial or avoid confrontation. You can be vacillating, and rely too much on other people, giving up your own opinions. You tend to have good style and good manners, are drawn to the arts, and want beautiful things. You need a partner all of the time, especially in love, and may always be on a quest for love. With your natal Mars in your 1st house, you come across as very energetic and enthusiastic. You approach everything that way, and need plenty of activity in your life. At times, you can be impulsive, aggressive, and inconsiderate of others. While you love to begin new projects, you have a hard time seeing them through to the end. You prefer being open and honest and don’t beat around the bush. There’s no point in sitting around and waiting when you have so much to do and so little time. If your rising sign is not Aries, you come across a little more like an Aries rising. If you are an Aries rising, you really play up Aries characteristics in your outward personality. With your natal Jupiter in your 1st house, you come across as optimistic and friendly. You may feel lucky in your life, but need to make sure you don’t push your luck too much. You can say whatever pops into your head without thinking and stick your foot in your mouth, but you’re so likeable that people don’t stay mad at you for long. You’re confident and can take the initiative. You’re not too serious, have strong beliefs, and believe that you can do anything with a positive attitude. If you’re not a Sagittarius rising, you can come across as one a little, and if you are, you really play up Sagittarius qualities. With your natal Saturn in your 1st house, you tend to be a pretty responsible person. You have an inherent knowledge of right and wrong, and you try to behave accordingly. Other people in your life may require a lot from you, and this forces you to be responsible from a young age, as well as puts into your head that other people have to come before you, which can lead to guilt or anxiety when you try to focus on yourself. You have to force yourself to push that aside and focus on you if you don’t want to suffer. You can also be way too hard on yourself at times. Asserting yourself can be difficult, and it’s better for you to take your time and let others go first. If you’re not a Capricorn rising, you can appear like one with this placement; if you are, you really play up Capricorn tendencies in public. With your natal Uranus in your 1st house, you come across as an individual and as someone who doesn’t care about adhering to the rules. You may color your hair wild colors, make your own clothes, and present yourself in a way that’s different and rails against social norms. Despite how shocking you may come across, you care deeply about helping others, and can be a great humanitarian. You just need to work on corralling your focus so you can be more dependable and get more done, otherwise it’s hard for you to stay on one thing for very long. If you’re not an Aquarius rising, you can appear like one with this placement; if you are, you really play up Aquarius tendencies in public. With your natal Neptune in your 1st house, you can be a sensitive and compassionate person, putting other people before yourself. You’re dreamy, imaginative, and creative, and you want everyone to get along. There’s a charisma to you that people like, and people tend to see you as they want to see you rather as for who you really are. You tend to run from confrontation and can have an escapist mentality. It can take time before you figure out who you really are without any input from anyone else. You take in everything from your environment, and need to be wary of chemicals or toxins, likely being sensitive to many things. If you’re not a Pisces rising, you can come across as one a little, and if you are, you really play up Pisces qualities in public. With your natal Pluto in your 1st house, you can come across as an intense person, and people take you seriously. You’re magnetic and have a seductive stare. You may always look like you’re brooding, even when you’re not. You strive for power to overcome insecurity. You can approach situations with grit and determination, and you like to look below the surface of people and situations. If you’re not a Scorpio rising, you can come across as one a little, and if you are, you really play up Scorpio qualities in public. With transit Mercury in your 1st house, your mind quickens and you take a more mental approach to situations. You think things through carefully, sometimes too much. You have many more communications with others, and you have no trouble offering up advice and gabbing with anyone around. You may take on more small tasks and focus more on the details, and have a hard time seeing the big picture. You jump from one thing to the next, not finishing anything you start, and feeling scatterbrained. You can come up with new ideas quickly, but may not see any of them through. You need to keep busy, or boredom will be likely. When transit Mars is in your 1st house, you feel more energetic than you have in some time, and it’s usually the most energetic period you have in about two years. You have more drive to do things, and are enthusiastic about new beginnings. This is a good time to start anything new, although you may have the tendency to start something and then move on to start something else quickly afterwards. Make sure you have physical outlets for the abundance of energy so you don’t get restless and agitated. You’re more impulsive, argumentative, and competitive. You can also be accident-prone during this transit, and get cuts, scrapes, or breaks. If you’re prone to getting headaches, you may get more of then now. When transit Saturn is in your 1st house, you see yourself for exactly who you are, and this helps you to be more realistic. Denial isn’t something that you can do well now. At the start of this transit, you may see something important happen in your life, for good or for bad. You can spend this transit improving your confidence, not by getting approval from others, but from finding something to pull from within yourself. You often walk away from this transit feeling much stronger and more secure in who you are as a person. You can make changes to yourself, your body, or your outlook. You can take on more responsibility and feel more mature. If you haven’t been behaving well, making good decisions, or denying your responsibilities, this may be a difficult time for you. Try to correct what you’ve been doing wrong, and it’ll improve. Often, this transit is an excellent time for starting something new, but it’ll be long-term and not something you see rewards from in the short-term. You’re making plans for many years to come. When transit Neptune is in your 1st house, you’re more sensitive to your surroundings, emotionally, spiritually, intuitively, and physically. You’re more imaginative, idealistic, and charming. You want change in your life, and if you know what you want, you can figure out how it aligns with your purpose in life; if you don’t know what you want, you can wander and feel insecure. This is a good time for creative ventures, and your compassion increases. You’re more helpful and put other people first.